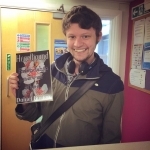 Daniel is a YA fantasy and paranormal author based in the Loughborough area. He self-published his first novel, Heartbound, in January 2015. Following his graduation from Coventry University in 2015, Daniel now works as a freelance copy editor and is keen to help other new authors achieve their publishing dream.